Plus Technologies has teamed up with a mobile print software company called Breezy. The goal is to provide a secure (Mobile) ‘cloud printing’ solution. An example situation for this solution is one of Plus Technologies’ large healthcare customers. The employees at this healthcare facility use tablets and phones to perform their jobs. Often printing from these devices is a requirement. The challenge with this is how to print securely and reliably from these mobile, non-networked devices. Plus Technologies has teamed up with a mobile print software company called Breezy to provide this secure ‘cloud printing’ solution. First, the users install the Breezy application on their mobile devices. Next, the application provides an ECP (Enterprise Cloud Print) queue for the user to submit jobs to. The cloud print queue, when it comes time to print, prints the users’ print jobs. Print jobs then go through the internet and are directed to a Breezy Windows based print server. The OM Plus My-Print-Delivery (MPD) system seamlessly ingests the Print jobs after they go through the appropriate driver. OM Plus My-Print-Delivery (MPD) is a pull-print/print-release system that holds the print job until the user is authenticated at the printer. The user can pick up the completed job after authentication and MPD routes the print job to the appropriate printer. A key point of integration between Breezy and OM Plus My-Print-Delivery is that OM Plus is able to pick up the user id along with the print jobs so MPD can properly authenticate the users properly. OM Plus My-Print-Delivery (MPD) software is Plus Technologies solution for pull printing. This type of solution is also called by other names such as print release, pull printing, follow-me, or find-me printing. 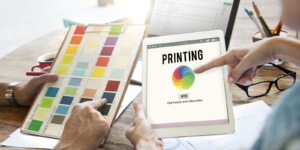 The idea behind the concept is to improve printing efficiencies by holding user documents in the print system until the user releases the document while physically at the printer or multi-function device itself.